Americans are living longer lives, and therefore it is important that housing environments accommodate their needs as they age. There are more than thirty million people in the United States with disabilities or functional limitations, and the number is increasing because of the aging of the population (Jones, 2001). The inaccessibility of homes for those with functional limitations could be avoided if houses incorporated Universal Design. Universal Design refers to products and environments designed to be useful to people of all ages, sizes, and abilities without specializing or adapting the design (Mace, Mueller, & Story Follete, 1998). The purpose of this paper is to explore the principles and benefits of universal design. What Does Universal Design Involve? There are seven principles of Universal Design (Mace et al., 1998). Principle one is Equitable Use葉he design is practical to people with various abilities. An example of this would be automatic doors that open when approached and allow a shopper to walk out pushing a cart or a person in a wheelchair to exit a building. Principle two is Flexibility in Use葉he design is flexible and accommodates different abilities. For example, a pair of scissors designed with two flat levers that squeeze together to work the scissors accommodates right-handers, left-handers, people whose hands are smaller or larger than average, or people who are missing fingers as the result of accident or congenital defect. Principle three is Simple and Intuitive Use葉he design is easy to understand, regardless of the user痴 know-how, awareness, or current application level. An example would be directions for putting furniture together with pictures in addition to words. Principle four is Perceptible Information葉he design conveys the necessary information effectively and efficiently, regardless of the individual痴 abilities or disabilities. For example, a person in a wheelchair could adjust a thermostat set at eye level with large numbers for easy reading. Principle five is Tolerance for Error葉he design helps to minimize the hazards in hopes of avoiding accidents. An example would be the undo button on the menu bar on a computer screen in Microsoft Word programs. Principle six is Low Physical Effort葉he design can be used efficiently yet comfortably with a minimum of fatigue by the individual. For example, persons who have bags in their hands or someone who lacks hand strength can operate a lever door handle by pushing down with little or no effort exerted. Principle seven is Size and Space for Approach and Use預ppropriate size and space is provided for approach, reach, manipulation, and use regardless of user痴 disabilities regarding body size, posture, or mobility of the individual. An example would be wide checkout lines that allow a person in a wheelchair to pass through with ease. There are three critical areas related to accessibility in the home: entrances, bathrooms, and kitchens. These problem areas could be accessible with a few minor adjustments during the building stages or during a remodeling project. Entrances. There are nice looking, universal solutions to entrance accessibility that do not involve building a ramp. If the home is currently being built, grading the area where the house will be built will allow the entrance of the home to be close to ground level so there will be no need to build a ramp. If a garage is in the plans, and the local building codes agree, building a sloped floor that provides an entrance on level ground is a solution. Another way of creating a level entrance would be to build a bridge that goes from point A to point B at the same level or by using earth filling to build up the ground level near the entrance. If an existing home needs a new accessible entrance, earth filling is the best choice and is ideal for accessibility (Mace et al., 1998). Bathrooms. Manufacturers make universal bathroom cabinets that include higher toe kicks and lower counters to accommodate wheelchairs. Bathroom sinks should provide knee space and can have electronic faucets. Cabinets with doors that fold out or cabinets that can be pulled out provide the necessary knee space for those in wheelchairs. For even more convenience, there are cabinets with upper shelves that can be lowered for easy reach by a person in a wheelchair or by those who are short. Some companies are now making prefabricated, curbless showers that allow easy access. Some conventional bathtubs have lever faucets located near the side of the tub for ease in reaching controls (McMillan, 1994). Kitchens. Manufacturers make universal kitchen cabinets that include higher toe kicks and lower counters to accommodate wheelchairs. For even more convenience, some cabinets have upper shelves that can be lowered for easy reach. Pantry units are available with rotating shelves and full extension drawer units so that the items in back can be reached. Refrigerators with doors side by side are available with shelves that slide forward to increase the usability for a wide variety of consumers (Workbench, 1998). Why Isn稚 Universal Design Being Used in Homes? Although Universal Design is a valuable concept, many people are not taking advantage of it. Most consumers feel that universal design products need to be more attractive and do not want to feel as though they are living in a hospital or nursing home. Consumers want the design to correspond with the appearance and style of their homes, whether it be Ranch style or Victorian. Figure A shows a bathroom in the home of a retired couple that could benefit from universal design so it could be accessible to both of the users. 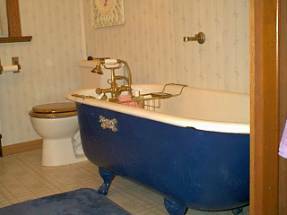 One modification would be grab bars with a Victorian flare and accented in brass to complement the brass on the bathtub痴 accessories. Manufacturers face a dilemma of producing grab bars that correspond with a variety of styles. Figure A. A bathroom that needs Universal Design. Used with permission by Patricia Leach, homeowner, March 14, 2002. Another dilemma has to do with accessiblity. When trying to make products more accessible, the question of proportion arises. How large should lettering be? What size button is large enough? How much pressure is too much or not enough? Designers know that they cannot make a product absolutely accessible and that there are no magic guidelines for proportions. Designers can make a product more accessible, but there will always be people who cannot use it (Zacks, 1999). Who Should Understand the Concepts? How do we get more people to listen and take advantage of Universal Design? Designers and builders need to be involved in hopes that they can incorporate the concepts and bring to life new ideas. Real estate dealers should also understand the need for Universal Design. The designers and builders, real estate dealers, and some future buyers can be reached by articles and or advertisements encouraging the use of Universal Design in industrial magazines and journals and other publication such as brochures and flyers. Designers and builders already understand the concepts of Universal Design but need to be encouraged to incorporate them into homes and office buildings for better accessibility of persons with disabilities. Future buyers can be reached by articles explaining and promoting the concepts in magazines such as Consumer Reports, Better Homes and Garden, and Traditional Home. Another possible way would be to promote the concepts on the radio with advertisements that give addresses to homes and showrooms that incorporate Universal Design. This paper explored how Universal Design will benefit people of all ages, sizes, and abilities. Consumers will save money if they are building homes to incorporate the concepts rather than building a home and later remodeling at a cost of more than double. Consumers who understand the principles and benefits of universal design can work with designers and builders to incorporate housing features that will add flexibility and long-term advantages. Jones, C. (2001). Designing for baby boomers and beyond: Universal design accommodates all user limitations. Appliance Manufacturer, 49(3), 52. Mace R., Mueller L., & Story Follette, M. (1998). The Center for Universal Design. NC State University. Retrieved January 22, 2002 from the World Wide Web: http://www.design.ncsu.edu/cud/proj_services/projects/kbr_ability.htm. Workbench. (1998). Universal design makes kitchen cabinets more accessible. Workbench, 54 (2), 59. Zacks, R. (1999). Universal access with style. Technology Review, 102(2), 92 �95.